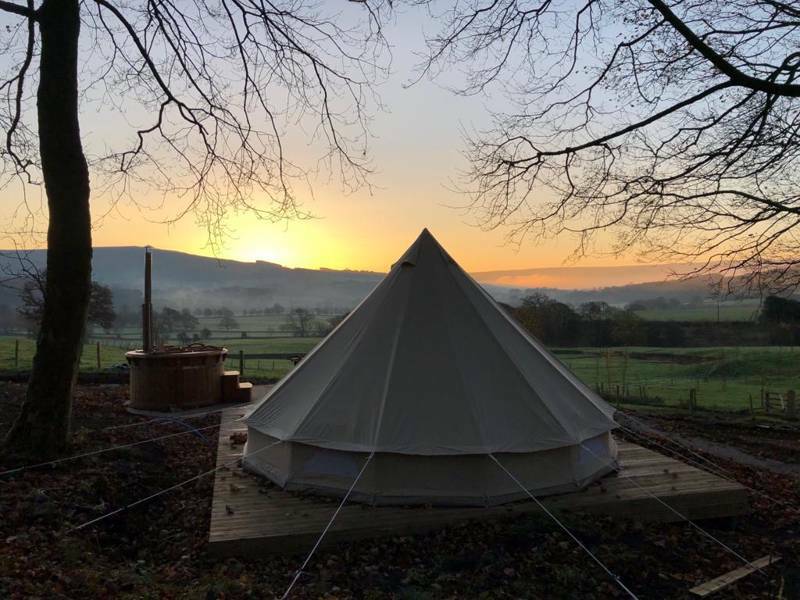 Luxury Bell Tent set in a stunning location on the woodland edge with uninterrupted views of the beautiful Yorkshire Dales countryside. Relax on your own private patio whilst gazing at the amazing views or take a dip in your log fuelled hot tub. Sorry, no dogs. 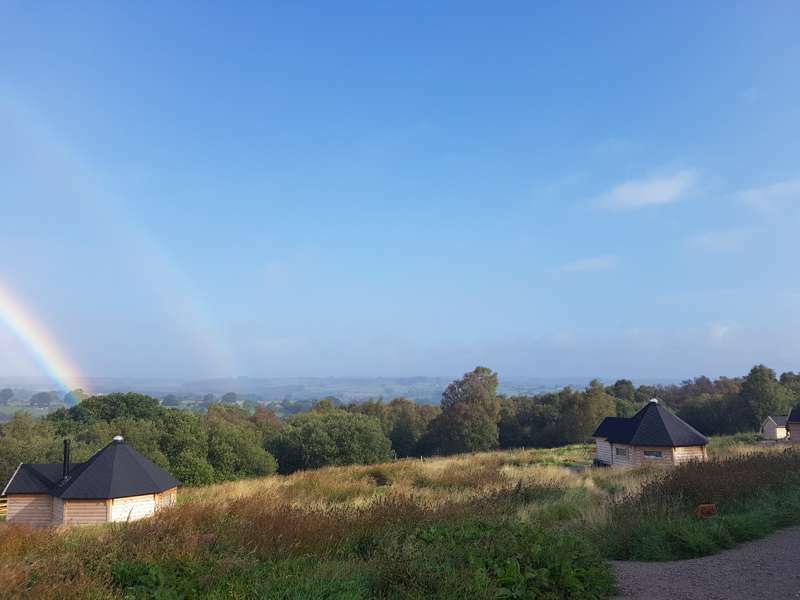 We are a small family run campsite in an idyllic location with spectacular views across the Wharfe valley. Offering a unique overnight experience on the Chatsworth Estate in the heart of Bolton Abbey within easy reach of local amenities and picturesque towns and villages. Offering a central location with plenty to do for all ages and in any weather. The campsite, close to Bolton Abbey, is the perfect base from which to explore the Yorkshire Dales National Park. A fantastic site for either an action packed family holiday or a tranquil relaxing break. Minimum 3 night-stay on Bank Holiday and 2 night stay on High Season (July 1st – September 1st). 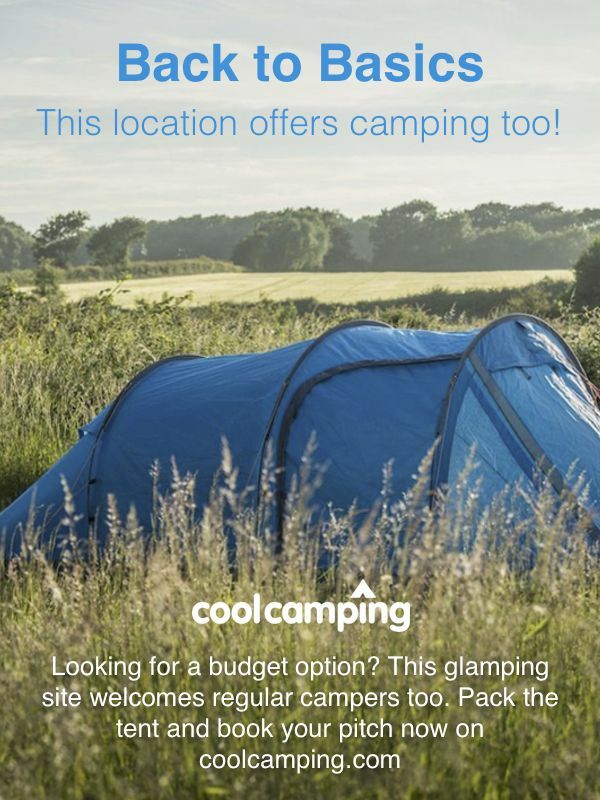 For latest availability and best prices for Catgill Farm Camping & Glamping, please use the Date Search above. Spacious pitches with a large grassy area and small stream with woodland on site that kids love to play in. Electric hook up and a modern shower block with hot showers, washbasins and toilets, including a dedicated disabled/family room in both male and female washrooms. Wash basins have plugs for hairdryers, straighteners and electric razors. There's also a separate washing up room with 6 sinks and 3 fridge-freezers you can use. Bell tents sleep up to 4 people, with a king-sized bed and futons (all bedding, linen and towels provided), a wood-burner, bedside tables, lamps, coffee table, blanket box, crockery, cutlery, utensils and a sink. They share a private shower and toilet pod, which is located nearby and also has an sink outside for pot washing. Pods sleep 6, with a double bed, 2 single bunk beds and a sofa bed. They have a fully equipped kitchen, en-suite shower rooms, Wi-Fi, a TV and central heating. 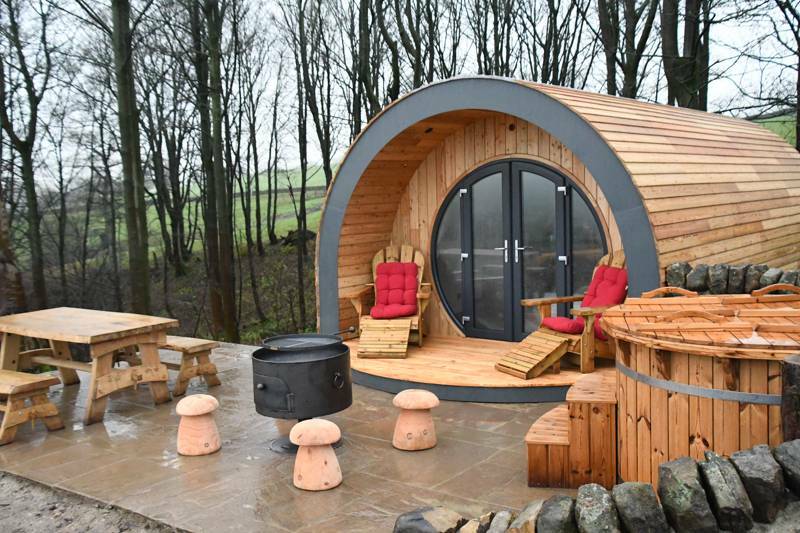 All glamping accommodation (pods and bell tents) have their own, private, wood-fired hot tubs and outdoor space. The campsite is on a number of excellent footpaths and those heading north will take you quickly into the Yorkshire Dales National Park. The River Wharfe meanders through the middle of the valley and just north of the village is The Strid, a notorious and impressive part of the river where the normally wide, gently flowing water is forced at high speed through a deep and narrow channel. Bolton Abbey (01756 718009) is just under a mile's walk away to the east and is free to enter (though £7 to park). Embasy & Bolton Abbey Steam Railway (01756 710614) is a similar distance to the south. Hesketh Farm Park (01756 710444), around the corner, is a pleasant family attraction: A working sheep and beef farm with animals to feed and stroke, tractor tours and a straw maze. Skipton lies just over 5 miles to the west, with a bustling high street, good pubs and restaurants plus a medieval castle (01756 792442) to visit. Ilkley's 14th century Manor House and the famous Bettys Tea Rooms (01904 659142) are also worth a visit. There's a small shop onsite selling essentials. A few pubs and restaurants are close at hand, including the 350 year old Devonshire Arms (01756 710441) with both its own brassiere and a Michelin-starred restaurant, The Burlington (01756 718155). But it's tea rooms that are the staple here, with Bolton Abbey Tea Cottage (01756 718000) serving morning coffee, lunch and afternoon tea from its splendid position overlooking the priory ruins and river Wharfe. The Victorian-built Cavendish Pavillion (01756 710245), serves hot and cold refreshments throughout the day while Tea on the Green (01756 718000), in the village, offers soups, sandwiches and cakes as well as a takeaway service – perfect for a riverside picnic. The Yorkshire Ice Cream Parlour (01756 710685) is also worth a mention. This a kooky '50s style diner serves tasty homemade ice cream as well as meals throughout the day. The quaint little village of Addingham to the south also offers several decent places to eat and drink. From Ilkley take the A65 towards Skipton, After a couple of miles turn right towards Addingham then almost immediately right again. Follow the road to the junction and turn right. Follow this road for approximately 2 miles and at the roundabout go straight on towards Bolton Abbey. In the centre of Bolton Abbey turn left (signposted Hesketh Farm Park) and proceed for about ¾ of a mile, the campsite is on the right hand side. From Skipton or Harrogate take the A59 towards Bolton Abbey. At the Bolton Abbey roundabout take the exit towards the village, turn left in the centre of the village and proceed for about ¾ of a mile. The campsite is on the right hand side. The Pride of the Dales bus no 74 runs between Ilkley and Grassington approximately every 2 hours from Monday to Saturday. A Sunday service on route 800/805 also runs between Ilkley and Grassington. The nearest train station is Ilkley – trains run to and from Leeds every 30 minutes. The lumps and bumps of this rolling camping meadow are all a part of its charm. This is real Yorkshire farmland and with so much space, marvellous Bolton Abbey on the doorstep and Hesketh Farm Park around the corner, the kids certainly won't be complaining. 160 grass tent pitches (30 with electric hook-up), 3 pods and 2 bell tents.